Grady Morgan goes up for two points for the Breakers against Saddleback on Wednesday, Jan. 25. Photo courtesy of LBHS Boosters. Breakers split their games last week but must defeat Estancia Friday, Feb. 3, to make the playoffs for the 11 straight year. 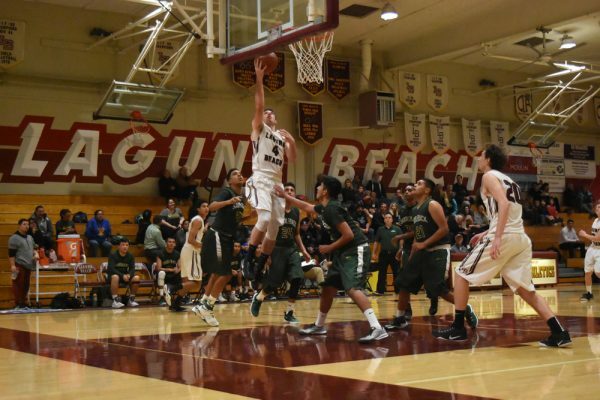 The regular home season concludes on Tuesday, Feb. 7, when Laguna hosts Costa Mesa for their 80th meeting. Breakers lead the series 56-23. The full squad returned to the court on Wednesday, Jan. 25, and the results were the seventh largest margin of victory in school history as Laguna hit on 11 three-point shots to rout the Roadrunners in Dugger Gym. Breakers took an 18-1 lead after one period playing all nine active players. The Grizzlies had no problem defeating the Breakers Friday, Jan. 27, as Laguna rotated their entire squad through the lineup creating some uneven play at times that Godinez exploited into points. Grady Morgan led in points with 16 including four three-point baskets. Burzell had 12, Charlie Rounaghi 9, and a much improved Ryan Meisberger with 8. Breakers lost a pair of league games last week dropping a 54-49 contest to Saddleback (3-3, 8-12) on Tuesday, Jan. 24, with Rachel Kenney leading Laguna with 22 points and Laura Nolan with 15. On Thursday, Jan. 26, league leading Godinez (6-0, 14-5) defeated Laguna 43-30 with Nicole Davidson leading the visiting Breakers with 12 points.